Uttarakhand enshrines Panch Badri- Here, Lord Vishnu is worshipped in different forms. Badri is a name of lord Vishnu. Every year, thousands of pilgrims visits here for worship and meditation. The legend behind this, that, actually Badrinath was the abode of Lord Shiva who used to reside here. But, Lord Vishnu happened to see this place and wished to reside there. He planned to hold the place from Lord Shiva. So, he took the form of a wailing child. Seeing the crying baby, Shiva's wife, Parvati, picked him up but could not calm the child. The crying of the infant, disturbed the meditation of Lord Shiva. She he left the place and went for higher reaches of the Himalayas and made Kedarnath as his home. And, Lord Vishnu take his original form and remain at Badrinath forever but the remainders of Lord Shiva's stay is here, the tree which served Lord Shiva and Badri the kind of fruitberry which was his the favourite. These five temples are settled at five different places starting from the height of 1,380 meters to 3,133 meters. Badrinath, a citadel to Lord Vishnu, situated at a height of 3,155 m is the place where Vishnu, Ganga, Saraswathi and Alaknanda confluence. Build in early ninth century AD, Badrinath is one of the most revered Hindu shrines of India dedicated to Lord Vishnu. It is also one of the four Dhams restored by Adi Shankaracharya in an effort to unify the country, along with Kancheepuram in Tamil Nadu in the south, Dwarkapuri in the west and Jagannath Puri in the east. The priests of Badrinath are from the southernmost part of India, i.e. Kerala. This is according to the rules laid down by Adi Sankara. Lakshmi, the consort of Vishnu loved Badri trees that were found in plenty in the area, hence the name Badrinath. It is also known as 'Tapobhumi', the land of meditation and penance and 'Bhubaikunth' (heaven on earth). Sri Badrinath Ji temple is located between the two mountain ranges of Nar and Narayan, with the Neelkanth peak(6977m) in the background. In the 8th century AD Adi Sankaracharya came to Badri and restored the ancient Badrinath idol from the Narad Kund and established in the Ganyr cave near Tapt kund. Tapt Kund, the hot water spring with natural curative properties believed to be the abode of Lord Agni faces the shrine. The pilgrims take a holy dip in the Taptakund before entering the temple. The temple remains closed from October to April due to the winter snow, when temperatures fall to sub-zero degrees. The pilgrims generally pay homage to the departed souls of their near ones in the Brahma Kapal, a flat platform on the banks of the river Alakananda. A rock boulder Sheshnetra, with the impression of Sheshnag, a mythological serpent and Charanpaduka, a boulder with foot prints of Lord Vishnu are of religious significance to the devotees. The other places of worship in Badrivishal complex are Gupt kashi (Arddh -Narisvara and Viswanath temples), Panch Kedar (Mad Maheswaray, Tungnath, Rudra nath, Kalpanath and Kedarnath) Vyas Gulfa and Ganesh Gulfa (where saint Vyas dictated the Mahabharata to Ganesha ), Bhim pul (where Bhim and Hanuman met ), Hemkund Sahib are other places where pilgrims offer prayers and oblations. Badrinath remains out of bounds for pilgrims for 6 months a year, from October to May. Yogdhyan Badri, at 1,920 m, is located at Pandukeshwar, named after the Pandva's King. It is said that the Pandavas, after the Kurukshetra War against the Kauravas, came to the Himalayas and, here they handed over their capital, Hastinapur, to Raja Parikshit and did penance before seeking out the highway to heaven. The importance of the Yogdhyan Badri is that, it's sanctum has an image of the lord in a meditative posture as that in main Badrinath temple. Yogdhyan Badri derives its name from the meditative position of the enshrined Badri idol. The copper plate inscriptions found at Yogdhyan Badri have helped providing valuable information on the history of the temple and Katyuri dynasty rule in the region. The temple is enshrined here is the lion-headed image of Narsingh, an incarnation of Lord Vishnu. Bhavishya Badri is known as the the future seat of Badrinath. It is believed that the arms of the dol are becoming thin and it is said that when the whole world will be undertaken by Kalyug, the arms will break. This is the first Badri, located at a height of 1,380 m at Animath. Before Badrinath was designated as one of the four Char Dhams, Adi Shankaracharya, found the idol of Badrinath at Naradkund, and restored. 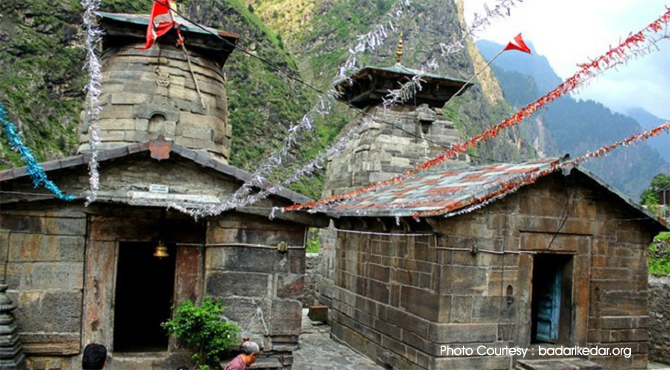 While Badrinath closes during winter, Vridha Badri remains open throughout the year. It is believed that Adi Guru Shankaracharya had initiated the construction of these temples. The main temple of Narayan is distinguished by a raised platform in the pyramidal form, where the black stone idol of lord Vishnu is enshrined.